Most are surprised at the wealth of information that is available through the gesture of handwriting. In reality, how we “move on paper” is highly symbolic and is a recording of the energy of our psyche. One must learn to properly read the symbols, though. Once, during a workshop I attended at the Atlanta Jung Society, Dr. James Hollis referenced a line by poet Emily Dickinson, “The sailor cannot see the north/but knows the needle can.” Hollis mentioned how Dickinson led a life of extreme social isolation, rarely leaving home or interacting with others. I was intrigued enough that upon my return home, I obtained a sample of Ms. Dickinson’s handwriting for examination. To my intense fascination, the poet’s writing revealed psychological traits that parallel two discernible characteristics we find in contemporary society: isolation and self-involvement. The study of human expressive gestures can trace its scientific existence to a natural law that appears to apply to all living creatures. Throughout the centuries, the alchemical maxim “As within, so without,” has reinforced the idea that that every human muscle movement is ripe with psychological information that can be understood by the educated careful observer. Body language, facial expression, and graphic gestures (handwriting, drawings, and even doodles) offer unfiltered, uncontaminated information about our subconscious drives, innate temperament, and possible neuroses or energy blocks (Wolff, 1943, 1948; Teillard, 1993; Nezos, 1986, 1993; Allport, 1933). We can “read” this energy for insight into personality and diagnosis of psychopathology. A portion of the power behind handwriting stems from the idea that the piece of paper on which an individual writes symbolically represents that person’s world. The way in which we put strokes on paper mimics how we see ourselves in the world, and how we move through it. Handwriting is essentially “brainwriting” (Roman, 1952; Bernard, 1985). How we express ourselves through writing originates not from our hand, but from neural impulses from our subconscious. Our movements on paper give us direct information into the organization of our brain and the state of our energy field, that is, the energy state of our thoughts and emotions. We can gain insight into others and ourselves by tuning in to the bidirectional relationship between body and mind. In fact, most of us already do this in everyday life in the reading of voice quality and body language such as facial expressions, gait, gesticulation, and posture. Handwriting, one of the many expressive gestures that humans make, supplies a permanent record, a snapshot in time of the state of balance or imbalance of our body, mind, and spirit. In the 1930s, American Gordon Allport, a Harvard educator, studied human motor behaviors and how they mirror personality. His treatise includes numerous controlled experiments, which identified congruence between expressive movements (e.g., handwriting, gestures, gait) and attitudes, traits, and values (Allport, 1933, pp. 247-248). Allport felt that evidence of well-integrated and consistent expression in human motor expressions would establish a “presumption that similar patterning is to be expected in all aspects of personality” (p. ix). Handwriting, he concluded, is a “crystallized form of gesture, an intricate but accessible prism which reflects many, if not all, of the inner consistencies of personality” (p. 186). 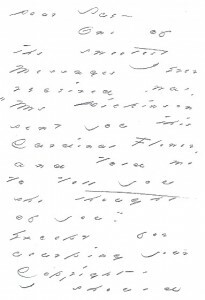 Ania Teillard, an Estonian psychoanalyst, was the first to research the link between depth psychology and graphology and to identify Jung’s psychological types through handwriting. Working closely with Jung for over 20 years, she laid the groundwork for understanding the handwriting indicators for the four Jungian functions and two attitudes. It may be the fact that her seminal work, The Soul and Handwriting, was not translated into English until the early 1990s that has delayed the recognition of the value and use of graphology in the United States for decades after its integration in Europe. Like all such systems, the psyche is a self-regulating energy system. It functions on the principle of polarity. Some of the major paired energies operating within us that we can readily see and interpret from writing are 1) intensity and relaxation, 2) objective/logical and 3) subjective/emotional. As one example of noticing polarity, regard the different between these two samples, with one being extremely constricted (controlled) and the other very relaxed (uninhibited). For contrast, here are a couple of samples of writing from people that are very ego-defended. There are more extremes in these writings, in various manifestations, indicating the inability to depotentiate the pull of the psyche’s polarities. 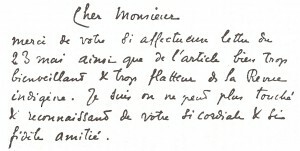 This first example shows imbalance in the stroke formations indicative of repression (constricted/squeezed letter formations) and depression (falling words and baseline of writing). Next we have a sample that indicates that the writer has feelings of inferiority (small middle zone height) along with being somewhat passive/helpless (soft stroke formations, lack of angularity). Finally, this next writing also shows inferiority feelings, noted in the small middle zone size, combined with overcompensation, as seen in the disproportionately large personal pronoun ‘I’ and the angularity of the stroke. When one looks at a handwriting sample there usually is something called the guiding image, or the most outstanding quality that is noticed which reveals a predominant aspect of the personality. If there is some idiosyncrasy in one’s personality it will be evidenced in the handwriting. Emily Dickinson’s writing changed over the years to become very peculiar, which is easily seen when comparing the two samples of her writing. The guiding image in the following sample would be her imbalanced use of space. Notice the very wide spaces between her letters and words, which mirror her emotional and physical isolation. Just as she needs space around her letter formations, she needs space in her emotional life. In direct conflict with her need for “space” is a profound need for affection and emotional display (far right-slanted letters). Being unable to make social connections and emotional bonds (wide spacing, disconnected letters) she found an outlet in her poetry. Notice the coiled nature to many of her strokes, which is a sign of being very self-involved; being all “wrapped up” in herself. Further conflict is seen in the fact that her writing has a very linear quality (intellectual orientation) yet she has rounded formations (emotional nature). There is a pull between her mind and her heart. Pressure is very light, which supports that she was sensitive, vulnerable and impressionable. Dickinson most likely has a highly spiritual and idealistic side to her. There is a fragility and weakness and outside influences could readily agitate her. She doesn’t possess much physical stamina. This lack of pressure combined with words in which the slope or baseline are falling, as well as the lack of connections all suggest depression. The sense of isolation, desiring of connection, and self-involvement that Emily embodied long ago is exactly what is being seen in the masses today. Our culture is leaving cursive writing behind with many not even knowing how to write other than to “print.” American public education is beginning to phase our the teaching of cursive writing as, due to most not knowing, some feel that computer skills are more needed. The article “A Case for Cursive” in the New York Times (Zezine, 2011) stated also that schools are taking considerable time for preparing the students for standardized tests, at the expense of learning how to write. Given that the ways in which we connect our letters gives information on how we connect with others and how we connect our thoughts, what might this shift mean for understanding ourselves, or being understood as a culture a hundred years from now? Humans express themselves in each and every movement we make—including handwriting, of course—and due to the amazing neuroplastic nature of the brain, we are constantly rewiring our brain by ways in which we move our bodies. Today’s “printers” reflect some very similar traits to those possessed by Emily : isolated yet desirous of deeper interpersonal connection, self-involved, and independent. Contrast that with highly connected letters found in cursive writing, which is indicative of a real methodical thinking process and the capability of deeper interpersonal connection. Carl Jung, whose own handwriting reveals a harmonious and balanced affect, believed his role was help his patients recover wholeness they had lost, and to help fortify their psyche so it could withstand any potential future dismemberment (Jung, 1961). Similarly, our growing understanding of the bi-directional relationship between body and brain is critical to developing and maintaining a comprehensive, balanced, and interpersonally connected psyche, both as individuals and as a culture. How we write can reveal a tremendous amount about our psychological traits, and the ways in which we think about and analyze it can tap into a true depth psychological process, allowing us to examine our potential for wholeness, but often raising far more questions than the answers it provides. It’s been well over a century since Dickinson’s death. How might our individual handwriting reveal certain traits about our society over a century from now as those individuals look back at the shift in our writing and relating? How is our growing reliance on technology likely to contribute to continuing evidence of isolation via our handwriting, if indeed it might? Is handwriting in danger of disappearing altogether as reliance on keyboards and electronic communication increases? What might be the future of graphology itself, along with its contribution to the field of depth psychology? Jung, C. G. (1961). Memories, dreams, reflections. New York, NY: Vintage/ Random House. Nezos, R. (1986) Graphology: The interpretation of handwriting, Volume 1. London, England: Scriptor Books. Schuetz, L. (2011). Freud & Jung: Written revelations. Personality Type In Depth (December 2011). Wartenburger, I., KÃ¼hn, E., Sassenberg, U., Foth, M., Franz, E., & van der Meer, E. (2010). On the relationship between fluid intelligence, gesture production, and brain structure. Intelligence, 38(1): 193. Retrieved January 14, 2010, from Psychology Module. (Document ID: 1928224711). Lisa Schuetz, a handwriting expert, has dedicated her life to investigating the neuroscience of thought and the reading of expressive gestures. Her publications include journal articles “Freud & Jung: Written Revelations” and “Partnering Type with Graphology.” Her chapter, “Reading the energy of thought” was published alongside that of Deepak Chopra, in Audacious Aging. Her research thesis, Sacred Proportion in Handwriting as an Indicator Body/Mind Balance was the topic of presentations given at conferences such as the Annual Canadian Energy Psychology.